The Tachyonized Ultra Vintage is a great Neo-Field generating pendant. Attractive as it is effective, the Vintage helps to both increase vitality and protect the wearer from EMFs. Simply wear the pendant every day to benefit from the 24mm Ultra Disk’s effects. One of the only tools in the world designed to not only increase the wearer's vitality but to also protect them from the harmful effects of EMFs as well. In instances where someone is out of balance due to illness or injury, the Vintage can help stabilize and restore imbalance, emitting positive, life enhancing energy as needed. Enjoy wearing it as it increases health and vitality. 30mm (1-3/16 inch) outside diameter with a 24mm (15/16 inch) Ultra Disk inside. 6.38mm (1/4") thick, and 15g (0.53 oz) weight. The Vintage Pendants come in a variety of designs and accent colors which are visible within the design openings. Please click on the thumbnail images to see the available options. 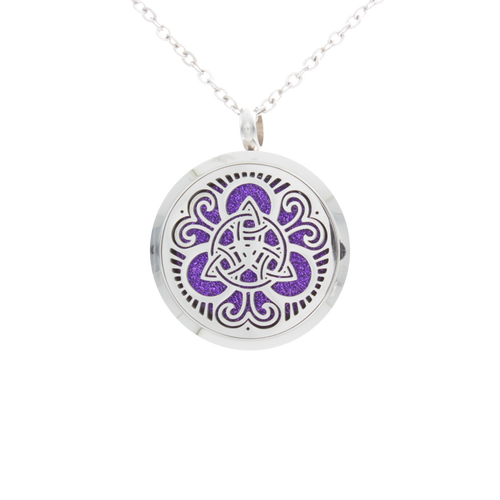 The exterior of the Vintage Pendant is stainless steel, and a free chain is included. Use caution with any chained pendant.